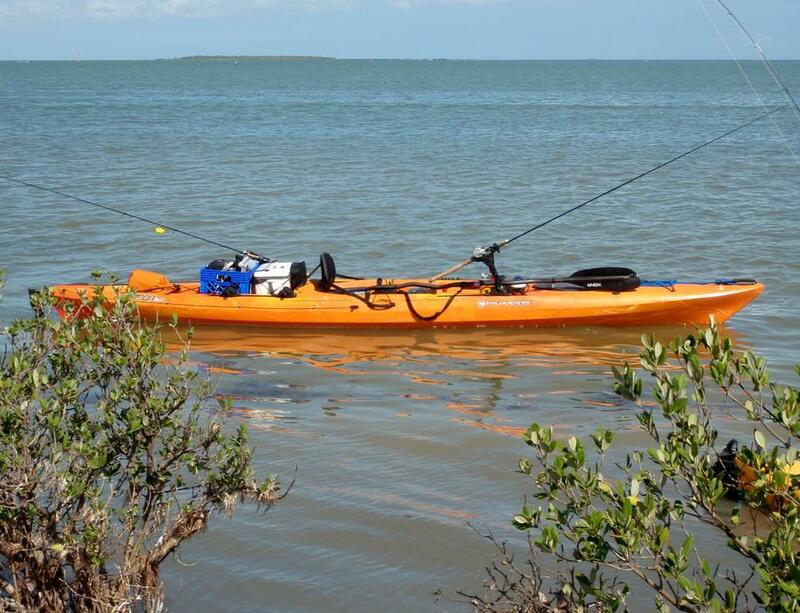 Anyone fishing a Bonafide kayak in saltwater? I currently have a Jackson Coosa HD and it's a good kayak. But I'm looking at going to a Bonafide SS127 for the bigger tankwell and the dry pod for my graph. It seems if you're still paddling a kayak on freshwater, then a lot of people are using the Bonafide these days. I'd like to have a Hobie Pro Angler but more money than I want to spend and it's not practical for the shallow water areas I go through when I'm fishing for reds and specks. I would test paddle first. Personally, for a dedicated coast kayak I would want a more efficient hull. Something long enough and with decent rocker to slice through the chop from the wind. Something which tracks well and has a lower profile, again for dealing with wind. I'm with Neumie here - you can get the Viking Profish Reload for $100 less. I believe Prof Salt is using one of these BTB, and people on corpusfishing from powerboats have reported him going out in conditions where they were tenuous in the powerboat. He's boated cobia and kings over 50"
Ideally I want to get a Tarpon 140 or similar from Ocean Kayak or another manufacturer for a dedicated saltwater kayak. Needless to say the Bonafide caught my eye and my thought had changed to selling my Coosa HD, getting the Bonafide, and then getting a Tarpon etc. Probably just going to stick with the Coosa HD and keep saving up for the Tarpon, etc. I think for an all purpose yak it would be slightly better than the CooaHD. Paddling characteristics I'd give the nod to the SS127 at the coast over the Coosa HD (I haven't paddled the Coosa Hd, but I have paddled the Mayfly similar enough). Not sure about the seat height on the Coosa HD, but on the SS127 even in the low position you sit fairly high off the water, which makes it a little harder paddling in the wind. One benefit of the SS127 is the ability to add a rudder which, IMO, is a necessary accessory for fishing the coast along the lines of an anchor trolley, drift sock, and stake out stick. I have had my SS 127 for over a year now and I fish only saltwater, mostly around Port O'Connor. I have have paddled several diffent configurations of yaks and the SS127 is probably the best hybrid between fast or wide. Not sure what your looking for but the secondary stability of the SS127 is very impressive. danaw wrote: I have had my SS 127 for over a year now and I fish only saltwater, mostly around Port O'Connor. I have have paddled several diffent configurations of yaks and the SS127 is probably the best hybrid between fast or wide. Not sure what your looking for but the secondary stability of the SS127 is very impressive. Yeah I really like the design. I need to try one out because as always it's finding the best compromise between speed and stability. The reason to go with the Tarpon etc. is for speed and covering distance. Plus the lower freeboard and a rudder would be nice in the wind. I’d paddle/test what you can. I’ve been kayaking for a little over 10 years and I’d have to say my two favorite kayaks were my Malibu X13 and my T160. Both sleep and low profile kayaks. I have a Moken now and I’d go back to a Tarpon 160 in a heart beat. I bought the moken to use BTB. Haven’t done much of that either way. I have paddled several different kayaks and ultimately ended up with a T160 and love it. Almost all of my fishing is done in saltwater in the bay. It is fast, tracks very well, and is decent in the wind. mwatson71 wrote: I have paddled several different kayaks and ultimately ended up with a T160 and love it. Almost all of my fishing is done in saltwater in the bay. It is fast, tracks very well, and is decent in the wind. I started out with my Dad's Ocean Kayak Trident Prowler that was 15.5' long. Fourteen feet is as long as I'm going to lol. I do plan on getting something like the Tarpon 140 or similar. I just ordered my Bonafide SS127. Looking forward to paddling it. Traded in my Tarpon 140, for what it's worth. I won't knock Bonafide, they made a great hull design and it has a decent amount of stability. Their seat locking mechanism is great, but plastic. The fold-in handles are nice and the overall deck layout is good (no clutter, open room for gear). If you're staying close to shore and aren't looking to go BTB every weekend, I think the SS127 would work just fine. My only issue with the Bonafide brand is how insanely thin the plastic is. We received far too many coming back from shipping that had huge rips and holes where most would have a light gouge (i.e. FeelFree). All that comes to mind with that is reef rash and the toll fishing in the marsh takes on a boat. But with thin plastic you get a very light boat that's easy to transport and haul. I've found that kayaks are about trade-offs, you usually give up one thing in turn for another. If you have a Bonafide PM me and let me know how you're liking it and what you're primary use is for. I'd love to hear it. I hit a piece of submerged concrete (old pillar or something for marking the road) very hard with my Coosa HD and that would probably rip a thin hull. I just need to get a plastic welder to smooth it out. Between shell and other sharp and hard things, I want a good hull which is why I'm willing to pay for a Tarpon or Trident. Why choose between stability and speed? The Viking Reload is good at both. A lot of us regularly stand in our reloads and my average cruising speed is about 4-5 mph. The best way to describe it is the stability of a Ride with the speed of a Tarpon. I have dragged mine across countless oyster beds and they are still going strong. My only issue with the Bonafide brand is how insanely thin the plastic is. We received far too many coming back from shipping that had huge rips and holes where most would have a light gouge (i.e. FeelFree). All that comes to mind with that is reef rash and the toll fishing in the marsh takes on a boat. I don't own a Bonafide and have no desire to get one. However, my buddy owns one and is one of the most durable kayaks I've ever seen. I'm familiar with thin kayaks b/c I still own a Malibu Mini-X, have fished with it for years through oyster reefs and every marsh condition imaginable...never experienced hull problems. Every kayak, including the Titan's, have and will experience rips or holes through shipping damage. That's why there is a huge generic disclaimer sheet on top of every kayak that I've ever been shipped strictly warning me to check it out carefully before that driver has a chance to get away. They could start building kayaks out of AR plate steel, and these freight company's will still figure out a way put rips and holes in them. Perhaps there is a completely different hull mfg process behind the SS107, but that little Bonafide is built like a tank and I wouldn't hesitate to take one through the marsh or beyond the breakers. My buddy actually got his Bonafide stuck on top of a jagged tipped tree while we were out fishing this winter. This wasn't an old, rotten tree. The tip got embedded into the side of a scupper hole so firmly he couldn't paddle or forcefully rock off of it. I took a rope, tried to pull him of while he paddled and rocked at the same time, but it still wouldn't budge. He was stuck in 15', 52- degree water right at dark without a wet suit on, so jumping out and swimming around wasn't an attractive solution. I was finally able to flag down a powerboat that came over, picked him up while I went over and lifted the rear of the Bonafide enough where the boat finally yanked it off the tree. As the outboard sucked water away exposing the submerged jagged tree tip, I was certain his Bonafide was taking on water, so we made a mad dash for the boat launch. The elderly gentleman in the powerboat trailed to make sure my buddy made it safely. When we turned the Bonafide over to inspect the hull, there was barely a scratch next to the scupper hole...after my 250lb buddy had aggressively rocked back and forth for almost 1-1/2 hrs trying to get free. I've also seen him dragging his kayak along the rough textured lake ramps without any visible sign of significant scratches, so reef rash shouldn't be a concern either. I purchased the SS127 this past summer 2018 & absolutely love it! When I was in the market, I was looking for something moderately priced, seat comfort, stability so I can stand on, & fish-a-bility (many things we all look for). I viewed many different videos for different kayaks including Bonafide. In particular, there is a YouTube video of someone pulling an SS127 behind a pickup truck through gravel, concrete & asphalt to test the durability of the hull. After several dragging trips, there was a lot of gouges & road rash. They placed a light in & around the outside of the kayak to see any thin areas & there were none. Needless to say, I was impressed since I primarily inshore fish where there is a lot of oyster shell. Bonafide also put out short videos on their standard equipment on the SS127 which was very helpful in my purchase decision. As far as tracking & speed, this a little cumbersome. Obviously, if want stability you will lose some on speed. For me, I’ll get there when I get there! Besides 99% of the time I’m looking for signs of fish in the back lakes, marshes & flats so I’m paddling slow.. If it is windy & you don’t have a rudder, the back end of the boat will swing around you because you do sit higher than most kayaks. The kayak is rudder ready but does not come with it. Bonafide just recently added a rudder that you can purchase separately for $199-ouch! There are some YouTube videos of people purchasing cheap ones for around $30 on the internet. I’m not sure how the SS127 would handle the BTB but inshore it’s great..